Located within Falls Avenue Resort complex, Adventure City has family fun entertainment covered. Travel though Adventure City and you will quickly realize that it is packed full of great family fun entertainment. The NEW Unlimited Access Pass gives you unlimited access the entire day to 5 amazing attractions such as the Traffic Slamm Bumper cars, Pink Panther Balloon Ride, Iwerks 4 –D Theater featuring Journey II 4D Ride and Mumbles Wilde Ride 4D, Happy Feet and Lost Safari Mini Putt. Also, stuffed full of amazing games to play including Dark Escape 4D Game, Pac Man Battle Royal, Sno Cross and the 13 foot Monster Drop Extreme. While visiting Adventure City join in the daily character parade happening at 3:20 pm. Characters include Pink Panther, Hershey Kiss, Cha Cha and Ozzie From the Rain Forest cafe on the Adventure City Promenade in front of the Rain Forest Café. Free arcade tokens will be given out during this time! If one thing is certain, there is never a shortage of fun things to do while you’re at Clifton Hill. From tasty treats to sitting back and being entertained, there’s always something fun going on in Niagara Falls. If you’ve never been to the Rainforest Cafe, now is your chance. The Rainforest Cafe, situated on the corner of Falls Avenue and Clifton Hill, is an experience you’ll never forget. Meet the Rainforest’s family of gorillas, elephants and snakes while you enjoy an easy-to-please menu with tex-mex style dishes. But beware – every 30 minutes the canopy lights up, lightning sparks and rain pours down the Rainforest’s indoor walls. Sure, watching everyone have fun on Clifton Hill often leaves us longing for the good ol’ days. Luckily, the Always Refreshing Soda Shop serves ol’fashioned floats, milkshakes, ice cream and soda with a variety of flavour shots, just like the 1950s. Be prepared to be refreshed, and travel back in time where the smiles were cheap and fun was free. Craving sweets, chocolate and heavenly treats? Welcome to the Hershey Store where you will be delighted by chocolate and fresh cookies, or milkshakes topped with whipped cream and the Hershey’s signature kiss. Bring home a five pound chocolate bar, or some deliciously scented candles like York’s Peppermint Patty or Reese’s Peanut Butter Cups. Did you say arcade? Adventure City has so much in store from classic arcade-style games, Guitar Hero, Dance, Dance Revolution as well as interactive rides like the Tour Bus Swat Team where you’ll overcome the bad guys to protect the city. In a rush? Get road-raged with Traffic Slam Bumper Cars, and explore the jungle with the Jungle Friends Fun House. Still not convinced? Then you’ll have to try the glow-in-the-dark Safari Mini-Putt. Ever experienced a movie 3D? How about 4D? The Iwerks 4D Moving Theatre provides the ultimate experience in movie-watching with its simulator style stadium seating, 3D moving technology as well as water jets and air blasters to provide the ultimate experience. Now you can visit the bottom of the ocean with SpongeBob SquarePants, or take a trip to Antarctica to meet Penguins with Happy Feet’s 4D experience. Guests of the 20 acre Falls Avenue Resort in Niagara Falls Ontario Canada will be treated to more than $300 in bonus attractions, show and dining passes at the popular destination this summer. The Resort Pass also includes four tickets to Danny Zzzz Master Hypnotist Show, and a Kids Eat Free Fallsview Dining offer. The Falls Avenue Resort is situated directly across from Niagara Falls, and is the largest Waterpark and Hotel complex in North America. Featuring exclusive attractions, entertainment and dining options, the Resort is the premier vacation destination in Niagara. The 20 acre Resort is home to the Fallsview Indoor Waterpark, Hershey Store Niagara Falls, Adventure City, Rainforest Cafe, Hard Rock Cafe, and premier hotels in the 4-Diamond Sheraton on the Falls,Crowne Plaza Fallsview-Niagara Falls, Skyline Inn, and Hampton Inn by Hilton at the Falls. 1) Waterpark Fun for the Whole Family. Rain or shine, bring your family to the Fallsview Indoor Waterpark and spin and splash in a giant water centrifuge super bowl. Ride high on the sides of the bowl and drop into the splashdown pool, as part of the Tube Tower the Plunge bowl. 2) Visit Seneca Casino across the Rainbow Bridge to watch Nik Wallenda, high-wire professional, train for his June 15th walk across the Horseshoe Falls. May 12-22, twice daily at 10:30am – noon and 3:30pm – 5pm. 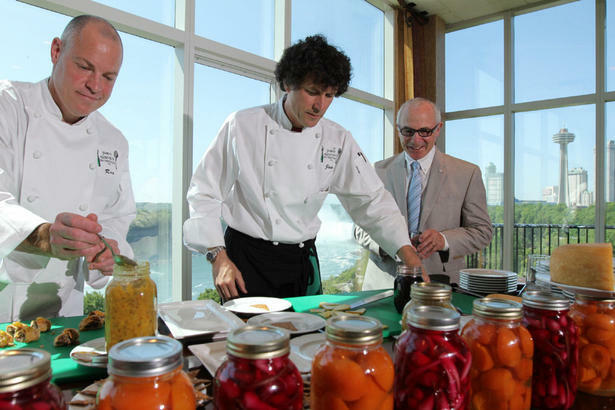 3) Enjoy not only the finest in local cuisine, but one of the world’s most spectacular views at the ‘new’ Windows By Jamie Kennedy located in the Sheraton on the Falls Hotel. 4) Satisfy your ‘sweet-tooth’ or cool down after a long day with a chocolate milkshake from The Hershey Store. Hershey has available snacks, fresh baked goods, and vintage gifts year-round. 5) Witness the wonder itself, the Niagara Falls, beautiful both during the day and at night. Experience the nightly Niagara Falls illumination of the Falls! 6) Enjoy a Day of Fallsview Pampering and Pedicures. Gather your girlfriends together for a day at the ‘newly’ renovated Christienne Fallsview Spa located in the Sheraton on the Falls Hotel. 7) Get mom out of bed with her favorite Starbucks drinks, available in many hotel lobbies in Niagara Falls. Summer season drinks are waiting for you to enjoy! 8) Adventure outdoors with Niagara Parks featuring the Floral Clock and Floral Showhouse, home of the World’s Tallest Flower only for a short time! 9) Take advantage of the May Deals and stay a night in a fallsview room. 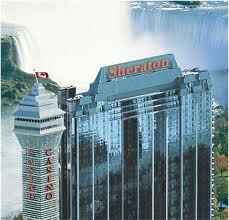 View both American and Horseshoe Falls from rooms in Sheraton on the Falls and The Crowne Plaza Hotel. 10) Fall back in time at the War of 1812 Exhibition at Willoughby Historical Museum May 19 – October 7. 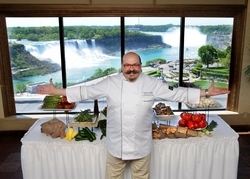 11) Engage your taste-buds at the Niagara Food & Wine Expo! May 25-27 at the Scotiabank Convention Centre. 12) Watch the spectacular Victoria Day and Memorial Day Fireworks over the Niagara Falls. Click here to view Niagara Falls Fireworks Schedule. 13) Enjoy the cuisine of celebrity Chef Massimo Capra best known from Food Network’s Canada’s Restaurant Makeover. Book a reservation for Rainbow Room by Massimo Capra today! 14) The warm weather means nothing more than golf season! Book a Niagara Falls Golf Getaway Package at one of Niagara’s premier golf courses. 15) Experience up close the escarpment by hiking the Bruce Trail, the oldest and longest footpath connecting parks, Niagara landmarks, wineries and forests. 16) With those extra days off school, keep the kids busy at Adventure City. Games, attractions and prizes will keep them entertained for hours. 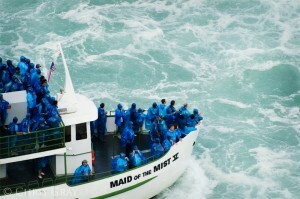 17) Enjoy the Maid of the Mist boat ride, now open for season, this ride to the bottom of the Horseshoe Falls is a classic attraction for every visitor to Niagara Falls. 18) Embrace the spring in the Niagara Parks Butterfly Conservatory. Explore colorful butterflies from around the world in a tropical environment complete with a waterfall. 19) Witness world class acrobats in Le Grand Cirque at The Fallsview Casino Resort May 15 – 28. 20) See who is bravest of your friends and family in one of the Niagara Falls haunted houses. Try not to become one of the thousands that have chickened out! 21) Bike the Niagara Gorge, fully paved, the entire family may ride past golf courses, greenery, landmarks, the Ontario power plant and much more unique to Niagara. 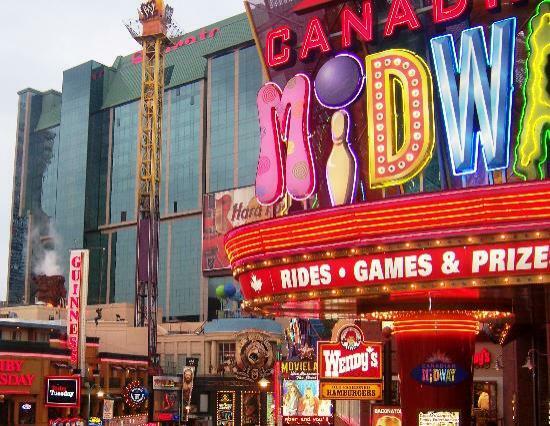 22) Walk up and down the famous Clifton Hill, many attractions and ice cream shops and treats for the warm weather, perfect for the entire family. 23) Watch Master hypnotist, illusionist, mentalist and magician Danny Zzzz live at Falls Avenue Resort. His dynamic performances showcase mind bending tricks, and spellbinding feats that will leave you in awe. Niagara Falls Most Popular Offer is Back – $300 in Dining/Attractions! Our Most Popular Offer is Back-Guests to Receive $300 in Dining/Attractions! Plan a Family Day or March Break Getaway on the Falls Avenue Resort and receive $300 in dining, show and attractions passes! Guests who reserve a hotel stay or a Fallsview Indoor Waterpark hotel package for arrival February 17-20 or March 9-18, 2012 will receive the bonus. Hotel Waterpark packages also feature 4 two-day Fallsview Indoor Waterpark passes. This limited time bonus is available at the Sheraton on the Falls, Crowne Plaza Hotel Niagara Falls – Fallsview, Skyline Inn and Hampton Inn by Hilton at the Falls. No visit to Falls Avenue would be complete without experiencing the excitement of the 3 acre Fallsview Indoor Waterpark! Standing six storeys high, the park features 16 of the fastest slides in Niagara, a giant wave pool, the Beach House Play Area with a tipping bucket ready to spill 1000 gallons of water on those below, Tiny Tot Splash Park for the littlest of guests, year round outdoor activity pool and sundeck, Planet Hollywood Beach Club perfect for a snack and more. The 20 acre Resort is North America’s Largest Hotel and Waterpark complex, home to the Sheraton on the Falls, Crowne Plaza Niagara Falls – Fallsview, Skyline Inn, Hampton Inn by Hilton at the Falls and attractions including Fallsview Indoor Waterpark, Hershey Store Niagara Falls,as well as popular themed restaurants including Rainforest Café, Hard Rock Café, Planet Hollywood and much more. For added convenience, indoor walkways run throughout the complex from the hotels to Waterpark and all attractions, dining options along the way. The Falls Avenue Resort in Niagara Falls Ontario Canada has a gift for guests arriving during the holidays – Niagara Falls dining, show and attractions passes valued at $300! The 20 acre Falls Avenue Resort is Niagara’s premier Fallsview destination, and making it home for the upcoming holiday season will be a rewarding experience with guests receiving an exciting holiday bonus exclusive to the Resort. Guests who reserve a Niagara Falls Hotel Stay or Fallsview Indoor Waterpark Hotel Package for arrival December 24, 2011 – January 7, 2012 will receive $300 in Niagara Falls dining, show and attractions passes. The bonus includes Kids Eat Free Breakfast at the Fallsview Restaurant, two $40 Fallsview Dining Gift Cards (one valid at the Rainbow Room by Massimo Capra, and one valid at the Fallsview Restaurant), two 4-D moving theatre movies each (SpongeBob SquarePants and Happy Feet), tickets for 4 to the Danny Zzzz Master Hypnotist Show, and passes for 4 guests for the MGM Movie Experience, Tour Bus SWAT Team, Combat Bumper Cars, Jungle Friends Funhouse, and Wild Safari Mini Putt. The offer is available at the four first class hotels located on the Falls Avenue Resort; Sheraton on the Falls, Crowne Plaza Hotel Niagara Falls-Fallsview, Skyline Inn, and Hampton Inn by Hilton at the Falls. Guests will receive the bonus when reserving either a hotel stay starting at $119 or a hotel waterpark package from $199 which includes hotel accommodations, and 4 two-day Fallsview Indoor Waterpark passes. Located directly across from the Falls and in the heart of the tourist district, the Falls Avenue Resort is home to first class hotels, attractions and dining including one of the most popular attractions in Niagara; the 3 acre Fallsview Indoor Waterpark. Situated at the Crowne Plaza Hotel with indoor connections to the Sheraton and Skyline Inn, the Waterpark features all day fun for the entire family. The Waterpark features 16 slides, a giant wave pool, mammoth Beach House Rain Fortress, 1000 Gallon Tipping Bucket, year-round outdoor sundeck and activity pool and Planet Hollywood Beach Club. 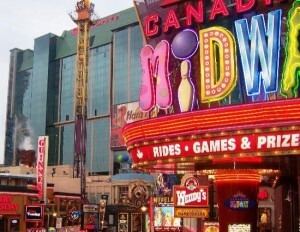 In addition to accommodations and the Waterpark, Falls Avenue also offers notable attractions including Adventure City, and MGM Movie Experience, and an appealing mix of dining options including Hard Rock Cafe, Rainforest Cafe, and Planet Hollywood, Fallsview fine dining at the Rainbow Room by Massimo Capra, and the Fallsview Restaurant. Make a Splash this Family Day in Niagara Falls!